A BENDIGO artist has taken out a Victorian award for a confronting black and white photograph of his nephew. Simon Penrose, 25, last night won a Victorian Indigenous Art Award for his work on paper. It was the first time the amateur photographer had entered his work in a competition. The Yorta Yorta man said ahead of the awards that he didn’t expect to take out last night’s prize. “I was asked to put some of my work in,” Mr Penrose said. “I highly doubt I’ll win. I am just an amateur. Mr Penrose received $5000 as part of the award. “Simon’s photograph is a confronting, arresting image,” the award judges commented on the work. Mr Penrose said his nephew, Jahmaine, was with the family on Christmas Day when the photo was taken. “His family had gone through a bit of a tough time,” he said. Mr Penrose’s photo is in an exhibition with other award winners in Melbourne. Exhibition curator Hannah Presley said the photograph was a stand-out in its category. “For me, the gaze of the child (makes it) hard to look away,” she said. 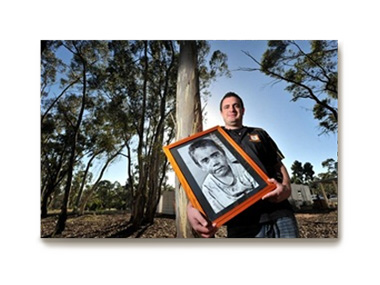 Mr Penrose, a mental health worker at the Bendigo and District Aboriginal Co-Op, got into photography at school. “I take photos because it is my way to release from work – it is good for your mental health,” he said. Mr Penrose said he loved photographing landscapes. He said the number of indigenous artists practising photography was growing.